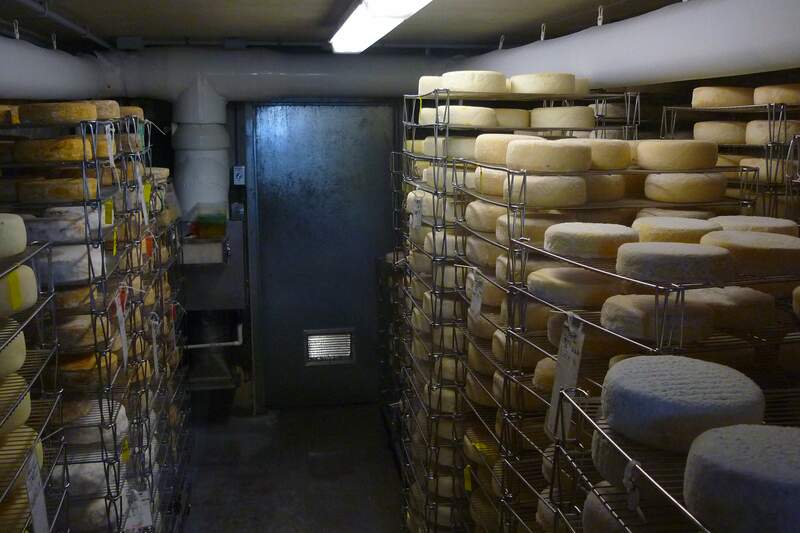 Our tour included an overview of the cheese making process, followed by a peek into the warehouse containing over $1 million in cheese. There were some interesting discussions about the milk quota system, which sets the amount of milk that cheese makers are entitled to; if they need more, they must lease the extra quota from another producer (which I assume is quite expensive). We were told that the only exception is when a cheese maker develops a cheese that no one else is producing, in which case, they can apply for up to 10 million litres extra quota per year. I’m not sure how they define a unique cheese, but apparently it doesn’t count if you just add different flavours (like hot peppers, for example). During the tour, we were told that Black River may come out with a smoked cheese in the future, as this is one of the most popular requests that they get. I’m not surprised, since Maple Dale Cheese is in the same region (north of Belleville), and their smoked cheddar is super popular. But for now, Black River has a very diverse (and delicious) assortment of cheeses to satisfy any cheese lover. Fifth Town is the world’s first Platinum LEED®-certified dairy, which means that they have built their dairy to rigorous environmentally-sustainable construction standards. Petra and her team have gone to great lengths to minimize their environmental footprint, including the use of wind, solar, and geothermal energy, and the processing of whey and waste water on site in a bio-wetland system. Visitors to the dairy can sample a variety of Fifth Town cheeses for free, and can take a self-guided tour of the facilities (make sure to pick up a tour brochure). On Saturdays, the company holds tutored wine and cheese tastings at 1pm and 3pm; reservations are recommended. For real cheese enthusiasts, there is also the Cheese Maker for a Day program, which provides an inside look at the cheese making process. For those who are considering a second career, Petra Kassun-Mutch’s story is very inspiring. She used to be a publishing executive and had no farming background, but followed her dream and has made it a success. The Confucius tattoo on the inside of her arm says it all: “Our greatest glory is not in never failing, but in rising every time we fall.” If you’re interested in reading more about Petra’s story, you can go here, here, and here. Also be sure to check out Fifth Town’s Meet the Team page – the coolest About Us page I’ve ever seen on a website! Fifth Town: Lots of samples!